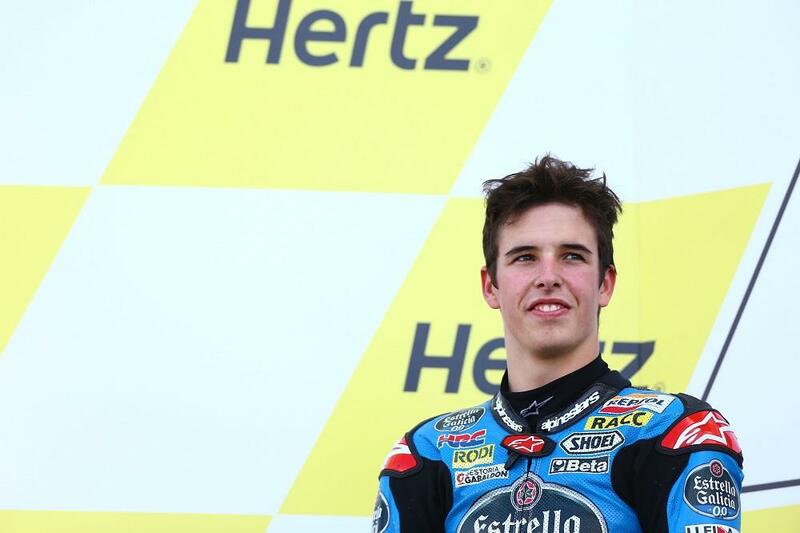 Alex Marquez has signed a two-year deal to join the Marc VDS Racing squad in the Moto2 world championship. The Spaniard, who is the younger brother of dominant MotoGP world champion Marc Marquez, will step up from Moto3 next season to partner compatriot Tito Rabat on a Kalex machine. Marquez missed out on a third Moto3 win of the season at Silverstone yesterday by just 0.011s, but his second place behind Honda teammate Alex Rins moved him to within 13-points of series leader Jack Miller. Ironically, it was Aussie Miller who was originally intended for the Marc VDS seat taken by Marquez, which comes at the expense of experienced Finn Mika Kallio. Marc VDS thought it had an agreement in place with Miller for 2015 and 2016 having signed a pre-contract with the 19-year-old a year ago. But Miller and his manager Aki Ajo denied the arrangement was binding and the current Red Bull KTM Moto3 is making the huge leap to MotoGP next season to partner Cal Crutchlow at LCR Honda. It has been a bad 24 hours for Kallio though. He led yesterday’s British GP for long periods before losing out in a terrific last lap tussle with Rabat. Defeat by just 0.063s dropped him 17-points behind Rabat in the title hunt but Marc VDS Racing boss Bartholemy said the capture of Marquez was in keeping with the team’s philosophy of developing young talent for the future. Kallio has been talking to Aprilia about a MotoGP ride in 2015 while his form this season, which has seen him take three wins and five podiums, will see big interest in his signature for Moto2. One team known to have expressed big interest is the QMMF squad, which will ditch the Speed Up frame and switch to Kalex.